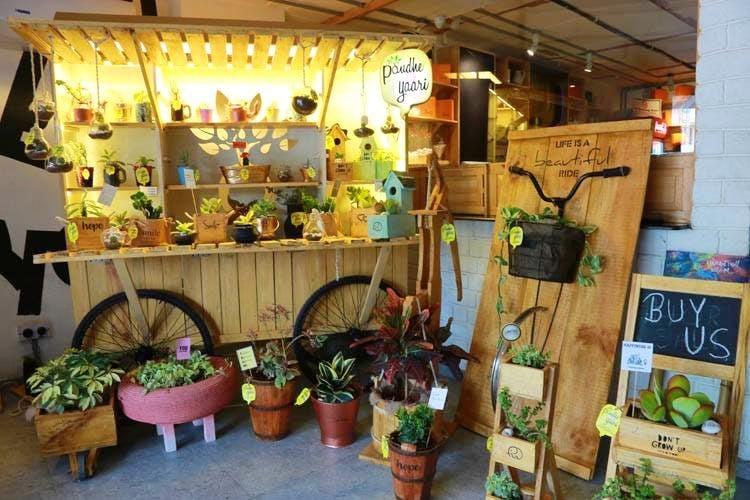 Paudhe Se Yaari in Film Nagar is a concept store that offers custom designed, quirky, and low maintenance plants for you to gift your loved ones. From succulents in painted wooden boxes to bonsai plants and pebble art, find it all at this nursery and gifting store. The brainchild of Gunjan Domingo, a designer, mother, and plant lover — Paudhe Se Yaari launched in August 2017 with an aim to make gifting plants a norm. At the same time, Gunjan has also incorporated art into the products to create a unique feel and aesthetics. Walk into the store and you shall find products like polka dot teapots, minion themed tire stacks that can hold plants, wine bottles holding plants, denim plant holder and more. The place is actually a run-down bungalow that has been done up with a lot of love and attention to detail to create a homely vibe. You have a plethora of options to choose from as the store has cacti, terrariums, succulents, kitschy wooden pots of all sizes, and balcony accents too. They also make plants available based on the season and occasion, so that the gifting process is always relevant. Like, for Valentine’s Day, the designs are more lovey-dovey with your loved one’s name on it. Apart from this, gardening tools, pebble art, tiny wooden fences, birdhouses, garden decor items are also available here, with a price range that begins at INR 150. You can also get your own plants custom designed by the team at Paudhe Se Yaari based on your requirement. So, whatever your mind and heart desire for your home, get it done here.